Neither of these words in the title are likely too familiar, and less so in these parts the tree that sometimes goes by that common name. Balm of course is a soothing ointment, and Gilead is in Israel. There is a haunting African American Spiritual that centers on this “universal healing” that arose from that piece of geography long ago. See and hear the video at the end of this post. It is quite well done. “SO what is this tree?” a friend asked recently at his grandson’s birthday party about 10 miles from town. We had both decided NOT to participate in the slip-n-slide going on a nearby slope, so were making conversation. I had no idea, and had to have help from a FB group devoted to such mysteries to identify the tree in question as Populus balsamifera, also known as Black Cottonwood. I defend my ignorance in part by stating the fact that this is NOT a native of Virginia. 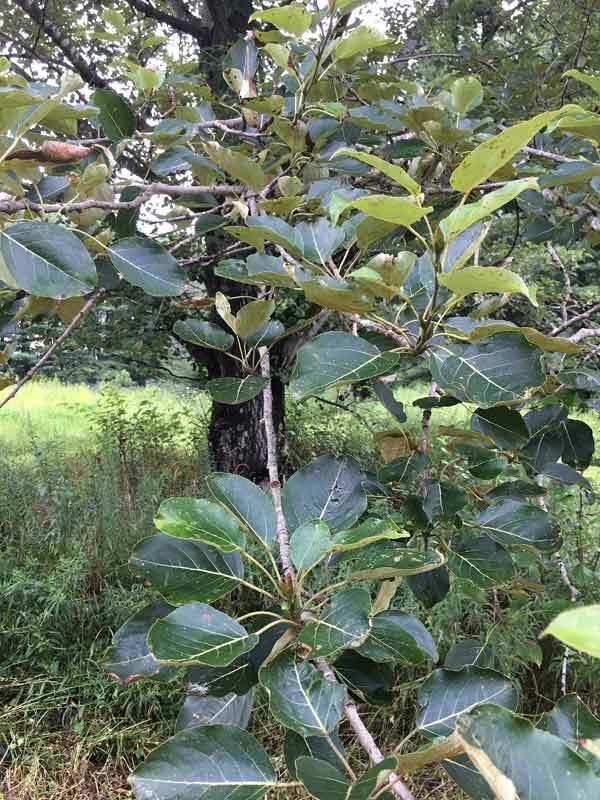 As a matter of fact, this tree is described as the “most northern-growing deciduous tree” and is far more familiar to Alaskans that Virginians. You can kind of tell that the back side of the leaves is rusty orange in patches. I did not take sufficient note of this while on site. Resinous secretions of a similar sort from the buds in spring is apparently where the sticky medicinal substance comes from. So I’m wondering if there are other trees like this–not native, but planted intentionally at some point. The two mature trees I saw were older than ME! Yes, that old. If either of my blog readers knows of other trees like this in FloydCo, please let me know. So if you want to see more pictures and find links from images of Balm of Gilead go here. If you want to learn more about medicinal uses of Balm of Gilead go here. And I encourage you to listen to the haunting melody, There is a Balm in Gilead in the video just below. Fred i know where one is and like you never new what to call it i was exploring my great gandpaws place in Oakvale wv. Along the old home sight way back in the mts on stony ridge on the map its right west of Stingle hill . Any way my Dad told me about a tree they used the sticky sap from for cuts but dint know what its proper name was . So when up at the old cabin sight near a dry creek bed i found it and so happened it was in the book of trees i had on me that day now dad called it a bambie gillard tree . But look as i might no name matched it but when i saw Balm of Gilead the tree matched its still standing gard at the old cabin sight . Hi Mike, I’m glad you are able to translate from bambie gillard to Balm of Gilead. Funny the ways even common names become altered by use over time. Latin names, small wonder they get almost immediately garbled. Paulonia becomes “balagonie” wood and Gallinsoga becomes “gallant soldiers” etc. Hi, Fred! This is very interesting to me. I see from the Wiki page that the Black Cottonwood is a member of the willow family, Salicaceae, so it seems apparent that it would have some of the analgesic and anti-inflammatory characteristics of aspirin, which had ancient use a a derivative of “willow bark.” It would also seem likely that a very useful medicinal plant would be spread far and wide by people who used it. I am anxious to ask my sister-in-law who was raised in rural Buncombe County and is pretty literate in herbals, if she is familiar with it. p.s. Ralph read an interesting article in the WSJ this morning about the shortage of botanists in the US! The black cottonwoods are all over our western travels. Their sticky sap dropped all over us one spring in Canada. Their white fluff has covered us in many campgrounds. I love their heart shaped leaves and super rough bark and have many photos of them, probably a favorite alongside Lake MacDonald in Glacier National Park. Just listened to the singing. So beautiful! Thanks! !